Aberdeen Research report made a strong connection between employee engagement and customer satisfaction in a recent study (find a summary here.) They summarized it best in this chart, tracking the relative success of companies that have an organized approach in fostering greater employee engagement. Our retail business was failing, and we examined why. We found people were not treated well in the shop. We did not solve it with training, we simply invited the employees to participate in our future success, and suddenly they were treating customer 1,000 times better. Repeat business went up and the store survived. And the employees started sharing ideas about how to make even more improvements. We agree wholeheartedly with this. Even if it is not a big new idea, it bears constant repeating so that it sinks in as an executive mindset. In 2015, with all the research supporting the power of employee engagement, HR should not have to sell the idea of funding employee engagement initiatives every year in the budget process. The money should be put there and protected by the executives themselves! 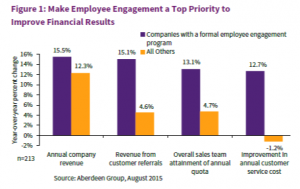 Aberdeen Research report made a strong connection between employee engagement and customer satisfaction in a recent study (find a summary here.) They summarized it best in this chart, tracking the relative success of companies that have an organized approach in fostering greater employee engagement. This theme about customer satisfaction following improved employee engagement pops up consistently in our work with employees and students. Favoritism is Corrosive to Workplace Morale – Change that Lazy Habit! Leadership Habit Change: Swap Negative for Positive! Leadership Kick-Start for 2018 – New Year, New Leader: YOU! Bovo-Tighe Wishes You the Best of All Possible New Years! Take the Spirit of Thanksgiving Back to Work This Week! A Halloween Golden Oldie from 2015: Workplace Zombies! Good Employees Still Need Guidance – Do Not Neglect Them! Do Employees Really Want Small Talk with the Boss? Which Employee Efficiencies Most Improve Productivity? Are You Running Continuous Performance Reviews? Employees Prefer E-Mail to Face-to-Face Conversations. Why? It’s May! Make the Most of Spring’s Bountiful Energy! Leadership Re-Start for Q2 2017 – Realign and Re-engage! Employee Engagement Issues? Time for a Chat! Leadership Kick-Start for 2017 – Spark Some Engagement! Happy 2017! Have a Great Year. Best Wishes for a Wonderful Holiday Season! How Well Do You Connect Your Team to a “Purpose”? As leaves fall, productivity rises. Harvest and focus your Autumn energy! Hidden Agendas, Curriculums and Biases – How Does Any Work Get Done? Why Do We Love the Month of May at Bovo-Tighe? Leadership Kick-Start for 2016 – Engage! Employee Engagement is Not Fun! Workplace Zombies that Drag Down Productivity – Beware! The ROI of Team Engagement – How to Measure? How Well Do You Grow Future Leaders? How Can Your Words Build or Break Trust With Co-Workers? Google Survey Connects Workplace Flexibility to Morale – No Surprise There! The Unbiased Opinion is a Myth. Discard It. Time to Act Civilly at Work? Professor Porath Says It Pays Off. When Motivating Employees, Do Words Get In the Way? Hiring Outsiders Costs Money. Save it by Investing in Human Development. How Quickly Does Your Culture Sub-Optimize New Talent? How Do You Fix a Jerk at Work? Valentines Day Marks the Halfway Point in Q1 – How Are Your Leadership Resolutions Fairing? January Leadership Advice Deluge has Begun! Resist the Urge to Read It All. Just Twenty Working Days ‘Till Christmas – What Can You Get Done??? Leaders Must Still Manage. You Don’t Get Off That Hook! It Takes Time to Change Employee Habits – And Lots of Support. Halogen Software Offers Sample Comments for Performance Reviews. We Disapprove! Maslow’s Hierarchy and Employee Engagement – Make the Connections! Sayonara June! Hola July! Time for Mid-Year Resolutions. Leaven Your Positive Leadership Outlook With Real-World Negativity – Pursue the Truth! Still Pushing Employees to the Brink: A bad habit from the Great Recession. Toyota Agrees: Machines Don’t Innovate – People Do. Does Your Online Presence Promote You? Machines Don’t Innovate: People Do. Hide From Your Manager to Get More Done! Why Does Leadership Development Fail to Create Great Leaders? Rob Markey of Bain and Co.: Employee Engagement Rocks! Stop Being Nice at Work? Not So Fast! 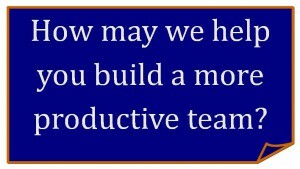 What Prevents Teamwork From Adding Value? How Can You Make a Vacation From Work Truly Stress-Free? Define leadership more broadly. Anyone can lead, at any level. Celebrating Failure? You Bet! How Else Can You Learn New Stuff? Is it possible to be overworked and underutilized? When Should You Micromanage Employees? Are Millennials Really Different About Job-Hopping? May the road rise to meet you on this St. Patrick’s Day. Get back to work: Engagingly! Happy New Year! What a Great Year 2013 Will Be. Our Holiday Newsletter – Celebrate the Past and the Future! Are We Too Engaged With Each Other At Work? Quotes that make you think – Are you open to the truths you need to hear? The Container Store: An Exemplar of Employee Engagement? Ordinary People can all be extraordinary: Anyone can lead! Employee Dissatisfaction Still the Norm in 2012 – Therein Lies Opportunity! Stop Hating Meetings: Fix Them Yourself! Leaders who seek “the truth” must first adopt the right mindset. Employees are Consumers of Corporate Culture: They won’t “buy in” until you earn their trust! The Cure for Bad Meetings: Pay Attention and Contribute! Why don’t more people quit? Book Review: How to be Happy, Dammit! How best to make leadership training truly work? Never stop! Technoserve extends its initiatives in Africa by leveraging Bovo-Tighe expertise. Irrational Decision-Making: Embrace the Human Factor! A standing ovation for an active client, Technoserve, which helps poor communities thrive worldwide! Talent Management: All agree we need it. Few act on it. Employee Engagement: Have you thought about ice cream? Changing Corporate Mindsets is the Critical Path to Cultural Change: Now We Have Research to Prove It! Corporate Cultures: Bottom-up change is best. Are people truly your company’s best asset? Can you prove it? On Leadership: Would you work for yourself? Why doesn’t employee training work better? About that left brain-right brain split: It doesn’t happen. With Leadership Development: Are We Smarter that Fifth-Graders? Corporate Flu Epidemics: What Sort of Infectious Attitudes Do You Spread Around? Change employee behavior by changing their bad habits. Be the first on your block to re-engage your employees. Performance Reviews done well require great communication. Thank you for this Kern- I will send it out tomorrow. Bovo Tighe Boosts Productivity by Raising Employee Engagement – Team by Team The ROI of Team Engagement – How to Measure? © 2015-2019 Bovo-Tighe WordPress Theme by ThemeMotive | All rights reserved.